Thank you for your interest in employment at Columbus Museum of Art. See below for current job position openings at Columbus Museum of Art. Please check back frequently for jobs at Columbus Museum of Art, an Equal Opportunity Employer. 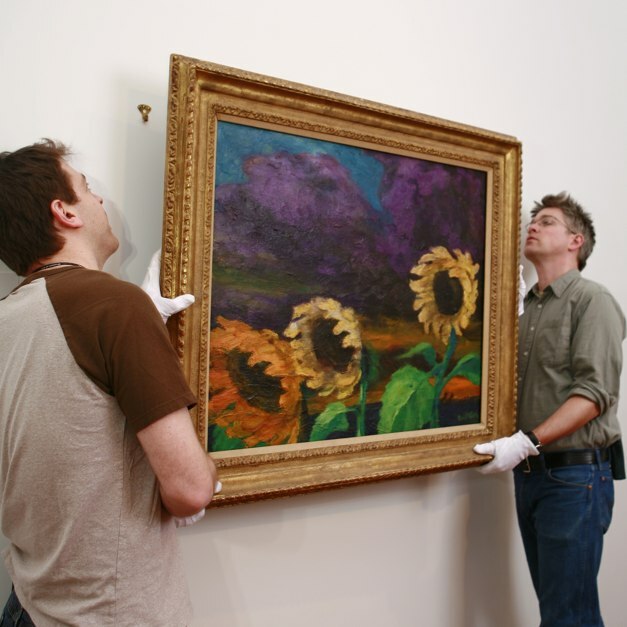 Columbus Museum of Art’s mission is to create great experiences with great art for everyone. Whether we are presenting an exhibition, designing an art-making activity, or giving visitors directions, we are guided by a vision to connect people and art. CMA nurtures that connection and removes barriers between our community and our collection. This mission also extends to events held at CMA, not only because of our outstanding venue, but because of our caring and attentive associates who are focused on providing efficient service and meaningful experiences. We are currently seeking a full-time Special Events Sales Manager for our Events Team. The Special Events Sales Manager must be an energetic and highly motivated individual who can create and develop new sales accounts, maintain and cultivate existing accounts and support maximization of new and repeat business opportunities for the Museum. The Special Events Sales Manager must be passionate about sales, capable and professional in coordination of corporate, social and internal events for the Museum, and provide superior customer service support to our clients. • Oversee all components of the sales cycle, including but not limited to responding to leads; facilitating site visits; handling negotiations and closings; and executing contracts and making appropriate follow-ups. • Arrange for and facilitate site visit and tours for potential clients. Attend client and internal meetings as they relate to planning and execution of special events. • Promptly answer phone and e-mail inquiries and respond to all sales leads. Qualify inquiries based upon availability of dates, event budget, or other pertinent factors. • Construct quote based upon event logistics. Negotiate event services and function space pricing within approved departmental booking guidelines. Finalize contract, securing signatures and perform scheduled follow-ups through date of event. Execute assigned events. • Track leads and maintain electronic CRM. • Compile and report monthly departmental data. • Develop and implement a cohesive sales plan for CMA Special Events. Plan and collaborate with CMA Marketing staff to create an integrated sales plan and drive the implementation of that plan across all channels. • Work with assigned Event Managers as a cohesive unit to assist with client coordination and maximize on upselling opportunities. • Convey and support institutional mission statement by seeking opportunities for all community members to interact with the Columbus Museum of Art. • Bachelor’s Degree in Sales, Marketing, Hospitality Management or related field as well as proven relevant experience with accountability for event sales and profitability of a sales operation. Venue sales experience preferred. • Experience of successfully planning and delivering corporate and social events. • Excellent written communication skills for a variety of purposes including the preparation of reports, articles, marketing materials, and event details using clear, direct, and persuasive language. • Excellent verbal communication skills in order to deliver persuasive and effective presentations, sale pitches, networking, negotiations, internal communications and relationship management. Must be a diplomatic individual who is confident and effective at dealing with people at all levels inside and outside of CMA. • Excellent computer skills including use of email, internet applications, MS Windows and MS Office software, and specific catering software (ReServe). • Target driven with proven sales ability. • Ability to prioritize and plan workload efficiently. • Cooperative team player and effective networker who fosters both internal and external partnerships and relationships. • Highly organized and self-motivated individual who can efficiently and effectively manage a wide range of tasks and objectives. • A ‘service driven’ and ‘can do’ attitude. • Ability to work well under pressure and prioritize tasks, using own initiative. • As with all special events/catering positions, flexibility and commitment to the job at hand is a must. • Ability to work nights and weekends, as well as 8+ hour shifts. This is a full-time position. Night and weekend work required. Benefits include health, vision, dental, life/AD&D, and 403(B) Retirement Plan. Short and Long-Term Disability and additional life insurance after 1 year of service. Generous paid time off and holidays. To apply, send cover letter, resume and three professional references to employment@cmaohio.org. NO TELEPHONE CALLS, PLEASE. Only those applicants considered for interview will be contacted. Must pass criminal background check. The Columbus Museum of Art is an Equal Employment Opportunity Employer. Columbus Museum of Art is where creativity and the daily life of our community intersect and thrive, as we champion new and different ways of thinking and doing. We celebrate the creative process and provide opportunities for people to cultivate and discover the value of creativity in their own lives. That philosophy also extends to our well-managed events – whether it be a corporate meeting, social gathering, wedding or any other type of event, the CMA Events team is all about efficient service and meaningful experiences. If you are a highly motivated individual who is eager and ready to take events management to a new level, this might be just the job for you! We are looking for a proactive, empowered problem solver who is eager to do what it takes to provide seamless on-site support to our varied clients. • Assisting in all components of the sales cycle, including but not limited to responding to leads, facilitating site visits, handling negotiations and closings, and executing contract with appropriate follow-up. • Attending client and staff meetings as they relate to planning and execution of special events. • Promptly answering phone and email requests, and coordination with clients and booked vendors. • Oversee and execute special event functions including set-up, teardown, staffing, and catering. Coordinating services such as A/V, security, catering and facilities needs with appropriate CMA staff for assigned events. • Tracking event changes and distribution of updated information on a timely basis. • Work with CMA team to develop sales and marketing initiatives. • Work with CMA Events team as a cohesive unit to assist with client coordination and maximize sales opportunities. • A Bachelor’s Degree in Communications, Marketing, Hospitality Management or related field as well as proven relevant experience with accountability for event sales and execution. • Minimum of 2 years’ experience in banquets, food & beverage, conference services, or history of successfully planning and delivering corporate and private events. • Refined verbal and written communications skills. Ability to deliver persuasive and effective sales presentations, negotiations, and relationship management. • A true desire to satisfy the needs of others in a fast paced environment. • Excellent computer skills including use of email, internet applications, MS Windows and MS Office software. Experience with or ability to learn specific catering software (ReServe). • Multi-tasking, great organizational skills and ability to prioritize and plan workload efficiently. • Poised to remain calm under pressure. • Upbeat and positive attitude. • Flexibility and commitment to the job at hand. Must be able to work a flexible schedule based on scheduled events, including nights and weekends as well as 8+hour shifts for longer events. Salary is $ 38,000 – $40,000 annually, paid bi-weekly, depending upon experience. Benefits include health, vision, dental, life/AD&D, and 403(b) Retirement Plan. Short and Long-Term Disability and additional Life insurance after 1 year of service. Generous paid time off and holidays. To apply, send cover letter, resume, and three professional references to employment@cmaohio.org. No telephone calls, please. Only those applicants who are being considered for interview will be contacted. Administration: Learn how a museum operates and functions as a non-profit institution. Assist with administrative tasks and behind-the-scene work to explore what it takes to make a museum run. Collections: Work with Museum registrars to monitor, track, and record the artworks in the collection as well as those traveling for exhibitions. Work with the archives and records of the artwork in the collection. Exhibitions: Discover how galleries and exhibitions come together. This department manages the galleries, makes frames and cases, handles and delivers artwork, and more. Learning & Experience: Connect with our visitors. Gain hands-on experience in front-end operations, public programming, school programming, or drop-in gallery experiences. Development: This department makes connections with businesses and individuals through endowments, memberships, and donations. Help to keep the museum strong by building key relationships. Internships are offered in the autumn, spring, and summer. Contact Amanda Kepner at amanda.kepner@cmaohio.org with any further questions about internships at CMA.